It has been said by some scientists that the simple deed of planting trees (many, many trees) would significantly reduce the greenhouse gas, carbon dioxide, that we spew into the air at an alarming rate on a daily basis. The least we can do is try to save the trees already in existence. The good news is that there are some simple actions that anyone can do to make a difference…stopping junk mail is just one of them, but an important step, since here in the U.S. alone, junk mail is responsible for the destruction of 100 million trees every year. If you don’t want to waste ‘8 months opening junk mail over the course of your lifetime’, take a few minutes now to stop it. 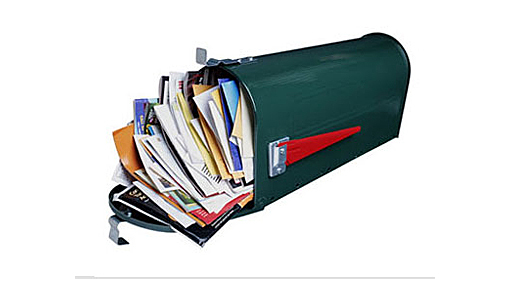 EcoCycle.org shows easy ways to stop junk mail. Also, sign a petition to stop junk mail. Whether at home or work, stop and think before printing anything from the computer. Ask yourself if it’s really necessary that you have a paper copy of something that you can easily reference with a click of a mouse. When it is necessary to print, opt for paper with recycled content. That which is labeled with a high percentage of ‘post-consumer’ recycled content is best. Recycle paper and cardboard. Reuse paper whenever possible. Choose to buy recycled paper products such as tissues, bath tissue, napkins, paper towels. Or, opt for washable linens to replace paper towels and napkins altogether. Sign up for e-statements and pay your bills online. This works well for everything from bank and investment statements to credit card and utility bills. Read your favorite magazine or store catalog online instead of receiving paper copies in the mail. Plant trees around your home. Not only does beautiful landscaping add to the value of your home, but proper positioning of trees will even reduce your heating and cooling bills and make your home feel more comfortable. Evergreens provide a great windbreak to help block those cold winter winds. Deciduous trees placed on the south and/or west side of your home will provide shade in the summer, yet allow sunlight to enter your home when the limbs are bare in winter. Go even greener by planting native species. Buy wood products only from reputable sources where the wood originates from sustainably managed forests. The ultimate verification of this is done through the independent, non-profit organization The Forest Stewardship Council. Avoid exotic woods, unless they are FSC-certified, because harvesting these woods is devastating to the world’s rainforests and our global climate. Thanks for the useful web sites to stop junk mail and to save the trees that offer us so much oxygen and beauty that needs to be appreciated.